http://www.JewishWorldReview.com | The last Jewish inhabitants were removed from the Gaza Strip this week. They put up no resistance. Unlike the emotion-drenched scenes two weeks ago, when 8,500 residents were expelled from their homes  some in tears, some in prayer, some berating or imploring or grieving with the soldiers sent to evict them  the Gazan Jews who left this week went in silence. That is because they were taken from their graves  the remains of 48 men and women, exhumed from what was supposed to have been their final resting place in the Neveh Dekalim cemetery. As part of Israel's "disengagement" from Gaza and northern Samaria, even the dead had to leave. Israelis know from experience what happens to Jewish graves that fall into Arab hands. 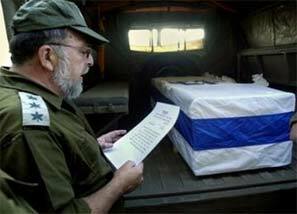 One of those reburied this week was Elkanah Gubi, an Israeli commando who died three years ago at the age of 21. In the agricultural settlement of Atzmona earlier this year I met his father, Moshe, who told me the story of Elkanah's death as we walked through the hothouses where until last month he grew orchids and other flowers for export. In March 2002, while on a weekend leave, Elkanah saw a terrorist firing at drivers near the Kissufim crossing into Gaza. He grabbed his weapon, leapt from his car, and returned fire, forcing the sniper to flee. But when Israeli troops arrived on the scene, they mistook Elkanah, who wasn't in uniform, for the terrorist. They ran him over with their jeep, killing him. To Moshe Gubi, the lesson of Elkanah's final moments was clear: "Against terrorists, you must fight  you don't negotiate, you don't make concessions." For the government of Ariel Sharon to be digging up his son's grave so the land can be turned over to terrorists is an outrage, he said. "They should be learning the lesson Elkanah died for." But if Sharon and the supporters of unilateral withdrawal are right, the departure from Gaza should mean fewer terrorist attacks like the one that cost Elkanah Gubi his life. No longer obliged to defend a Jewish presence there, physically separated from the Palestinians by a security fence, Israelis ought to be more secure without Gaza than they ever were with it. For years, Israel has been told much the same thing by its critics: Since the "occupation" of Gaza and the West Bank is the cause of Arab terrorism, the way to end Palestinian terrorism is to end Israel's presence in the territories. But far from reducing the terrorists' bloodlust, Israel's retreat from Gaza has only inflamed it. In just the past two weeks, a Palestinian knifed a Jewish student to death in Jerusalem's Old City, an Israeli policemen was stabbed in the throat by an Arab in Hebron, Kassam rockets were fired from Gaza into the southern Israeli town of Sderot, a suicide bomber blew himself up in Beersheba's crowded bus station, a Katyusha missile launched from Lebanon exploded in the Israeli village of Margaliot, a firebomb was thrown at an Israeli vehicle on a highway outside Jerusalem, and a 14-year-old boy from Nablus was caught with three bombs. In a videotape circulated by Hamas this week, archterrorist Mohammed Deif vowed that Israel's departure from Gaza would mean more of the same. "Today you leave Gaza in humiliation," he taunted the Israelis. "You are leaving hell. We promise that tomorrow, with Allah's help, all of Palestine will be hell for you." For the umpteenth time, an Israeli government spokesman urged the Palestinian Authority to disarm and dismantle Hamas, as required by the international "road map" it has agreed to. And for the umpteenth time the Palestinian Authority made clear its intention to do no such thing. In Damascus, Palestinian Prime Minister Ahmed Qurei personally assured the the heads of Hamas and Islamic Jihad that the PA would not disarm or interfere with them. "There will be no calm until the establishment of an independent Palestinian state with Jerusalem as its capital," Qurei told reporters. Israel might be out of Gaza, in other words, but the murder of Jews would go on. As always, the political hatred was reinforced by religious hatred. "The Prophet Muhammad foretold in a hadith that 'Judgment Day would come only when the Muslims fight the Jews, and the Muslims kill the Jews," the deputy director of the Palestinian Clerics Association, Sheikh Muhammad Ali, said on Hezbollah's Al Manar TV. '"Allah willing, we will enter [Palestine] as conquerors and liberators, not through negotiations but through jihad . . . because the hadith goes: 'And the Muslims will kill the Jews'  there is killing involved." The retreat from Gaza is a reward for such hatred and the violence it fuels. In the war on terrorism, civilization has just suffered a defeat. JWR contributor Jeff Jacoby is a Boston Globe columnist. Comment by clicking here.